We all have them – friends and family members who seem to have everything and are therefore difficult to buy holiday gifts for. 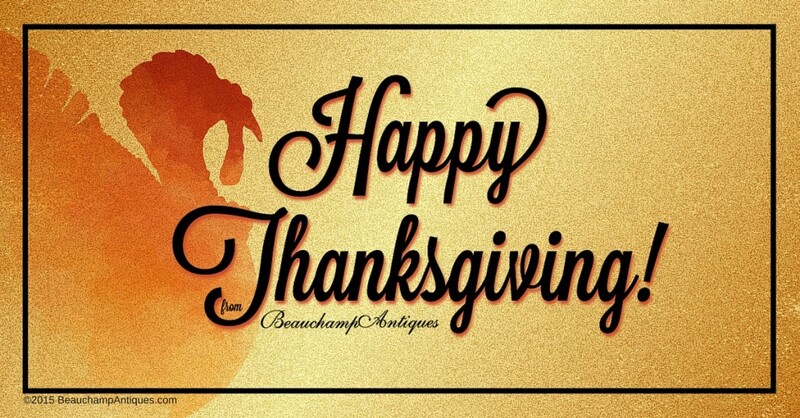 If you are on the hunt for something truly unique, then Beauchamp Antiques is the place for you. Almost any interest or theme can be found in antique indoor accessories. Wine enthusiast? 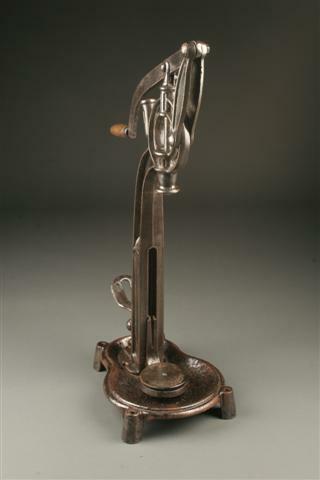 How about an antique wine corker? Dreaming of a trip to England? How about an English smoker’s cabinet? Francophile, or lover of all things French? There are too many options! Know someone who is always throwing a get together? Our collection of platters, servers and display items would be a welcome gift. 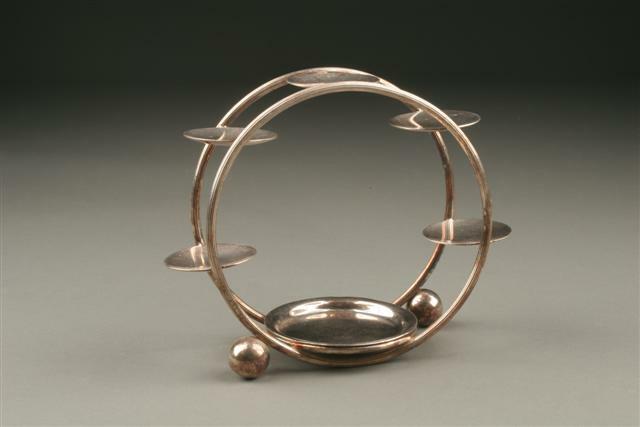 The unique shape of this early 20th century silver bon bon dish shown above will add interest to the dinner or buffer table. It could be used as originally intended – to serve delicate desserts – or to add ambiance to a table by holding tea lights. At Beauchamp Antiques, we use it as a business card display while it awaits its new home. We love the versatility of this piece. Walk in to most home décor stores and you will find a beach or seaside oriented section. 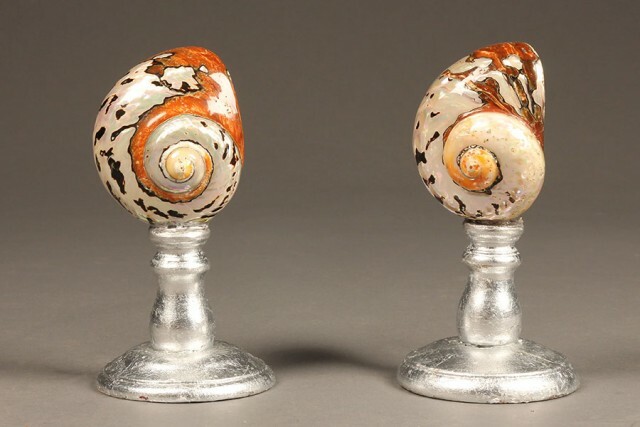 However we challenge you to find pieces as authentic or realistic as these richly colored nautilus shells pictured above! Placed on a 4” decorative base, they offer a different way to express one’s love of the ocean. 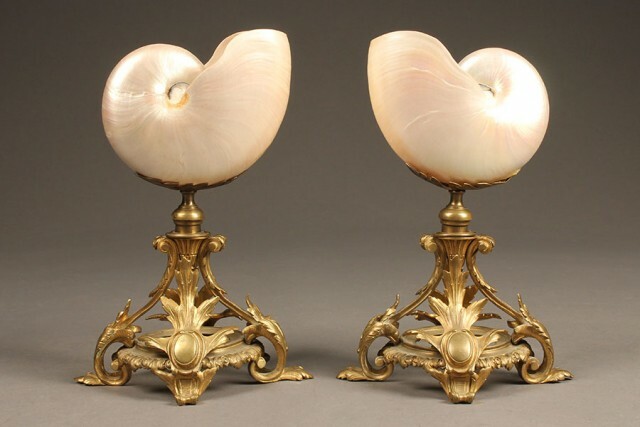 While they are the perfect compliment to a shell collection, the nautilus would be an interesting accent piece in any décor. 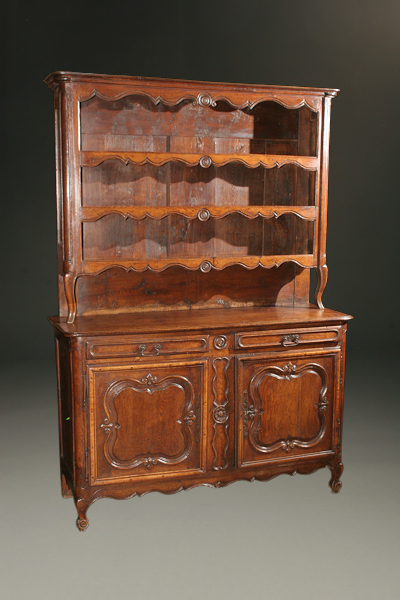 The English smoker’s cabinet pictured above is the perfect example of the history and romance inherent in antiques. Tobacco played a large role in Europe and in the birth of the United States. These pieces were created and used to store the storied leaves as well as their related implements, and are a rare find today. Whether in a living room, dining room, great room or study, this piece would surely invite interest and conversation from guests. Another rich part of our shared history is another vice – alcohol. 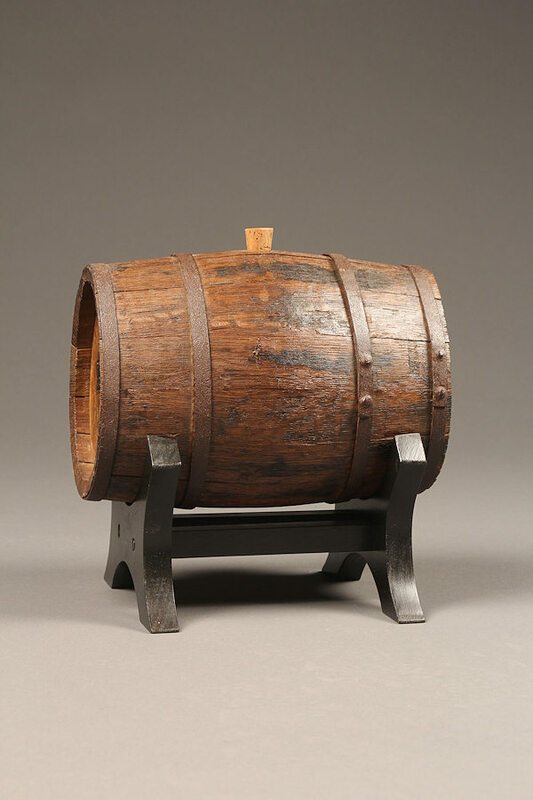 Circa 1880, this beautifully crafted French cognac cask allowed for easy transport of one’s personal stash. Made out of French oak and paired with a stand, this antique would make quite the statement in a home bar area. Everyone gives a wine lover wine, so why not try something different? The wine corker shown above would have made its original home in mid-19th century France. Today, if the gift receiver is an amateur wine maker, they can use this corker to preserve their own creations! 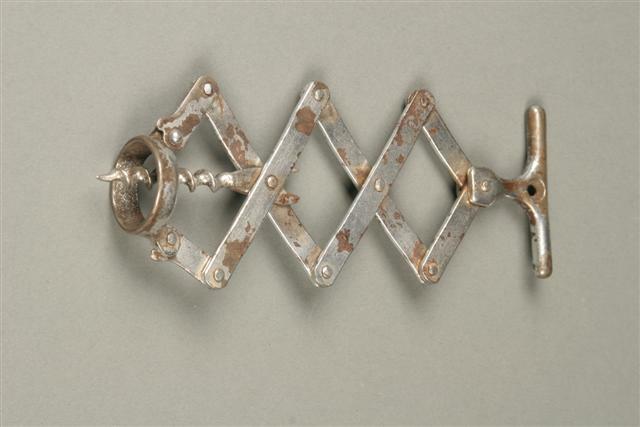 We have another French antique for the wine enthusiast – a nickel-plated zigzag wine opener. Make sure you are there when they open their gift because half the fun will be watching them figure out how to use it! While fully functional, it would also serve as a unique accessory for a wine cellar or bar. Gizmos and gadgets are a cook’s best friend – why not give your favorite culinary genius one they are more than likely not going to have already? 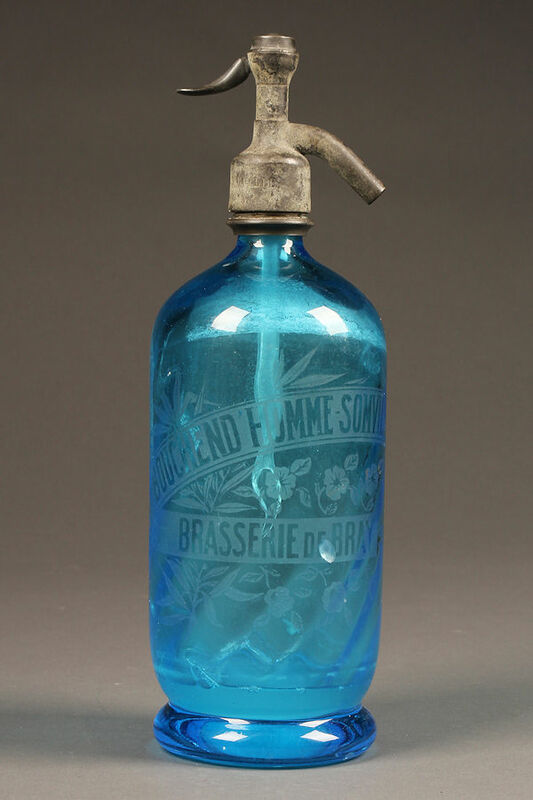 At Beauchamp Antiques we have a wide variety of antique French seltzer bottles, which can add a bit of romance to a kitchen décor. The thick glass comes in many colors, and some are etched with company logos from a bygone era. 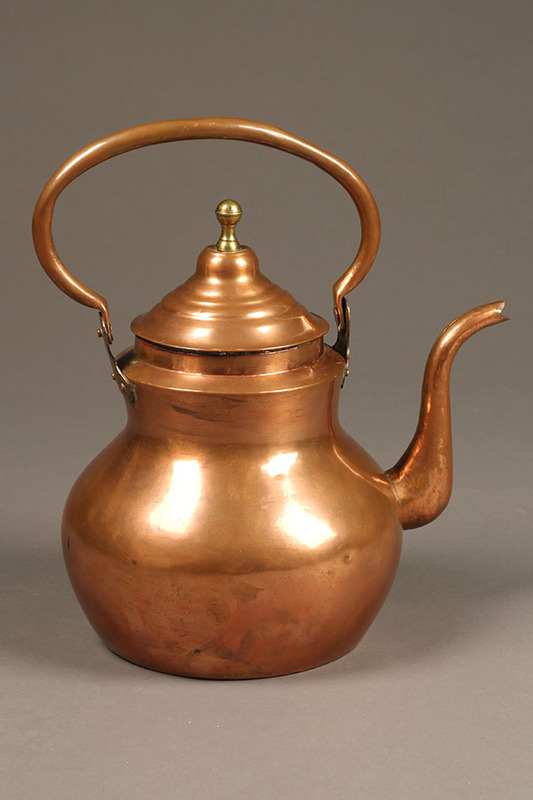 The spouts are made out of pewter that has aged into a lovely patina. These seltzer bottles are also perfect for the Francophile in your life. 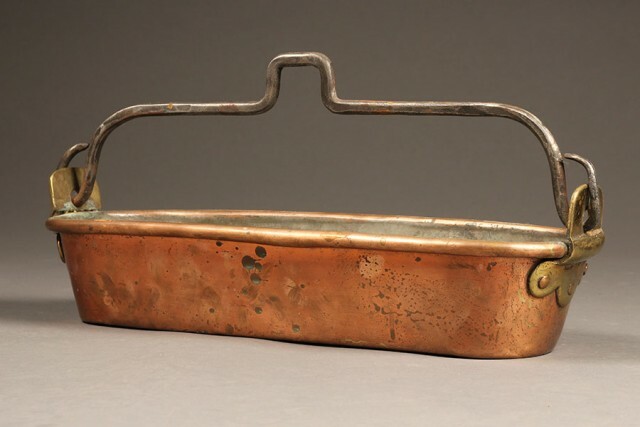 Click here to see other antique indoor accessories for one-of-a-kind holiday gift-giving. Or, give us a call at 1-800-860-0109 – we can help you find the perfect gift for your hard to buy for loved one. Classic French Louis XV style, ­this vaisselier has a very functional layout with plenty of blind storage, a serving surface, and many places to display plates. Made from oak with a lovely patina, its handsomest features include elegant hand carvings, beautiful iron hardware, handles and escutcheons. 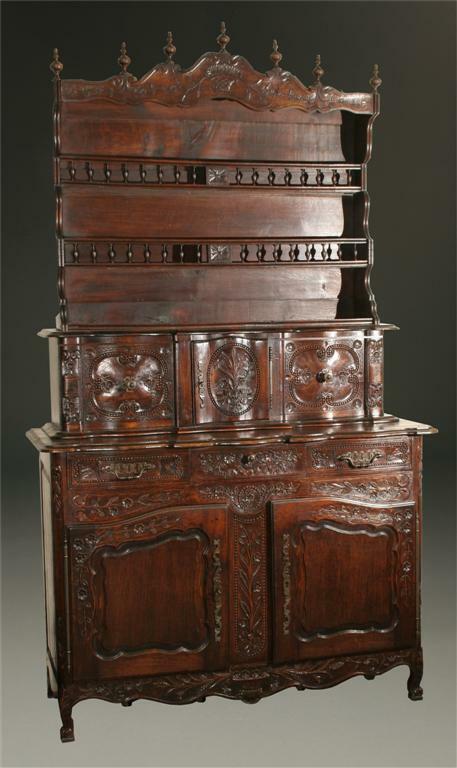 French Neo Rustic Louis XV style , this oak vaisselier has extraordinary floral carvings and nice decorative finials along the top. Beautifully proportioned, this piece offers lots of storage and display areas; the center door is a conventional right­-swing door, and the side doors slide to the outside. Country French Louis XV style, early 19th century, this piece has ample display storage for china and blind storage for table linens. Its large serving surface makes this piece very usable today. The oak has a nice red tone to it, with decorative carvings such as the medallions featured in the middle of the face molding on the shelves. Questions about these or our other vaisselier? Send us an email, or give us a call at 1-800-860-0109. Dutch Tall Case Clock in Burr Walnut signed by an Amsterdam Maker: Features a satinwood inlay. 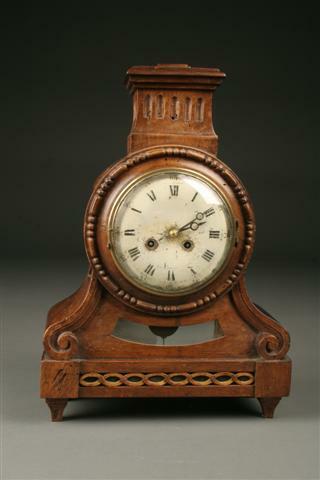 Very often with Dutch tall case clocks of this caliber you would see statues used as finials. On this piece, the statues portray Atlas holding a globe and trumpeting angels. Antique Dutch Bombe Bureau-Secretary with Fitted Interior: This piece features the closed upper cabinet and the bulbous bottom often seen on Dutch furniture. 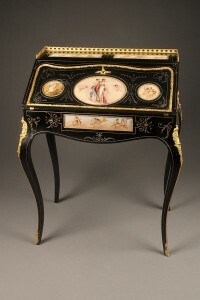 Inlaid Bombe Desk, circa 1910-20: Note the intricate inlay of the Dutch style bombe with multiple compound curves. 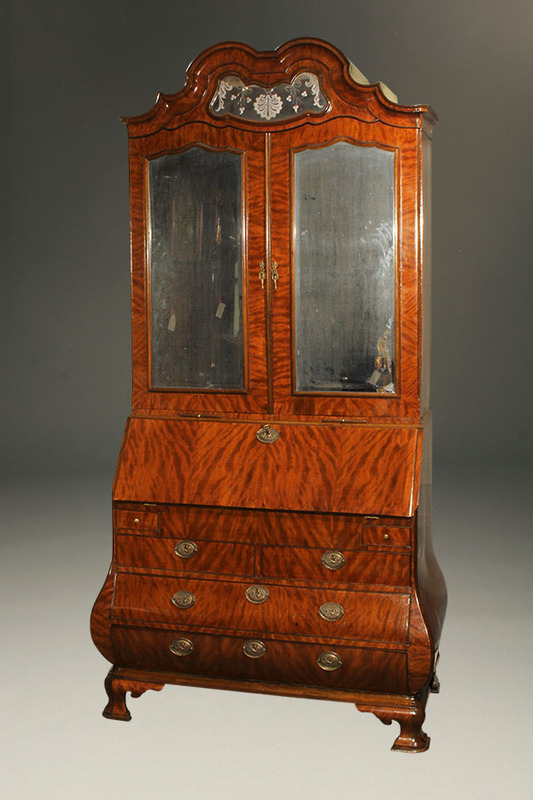 18th Century Dutch Kabinet in Mahogany with Burl Veneer: Kabinets are a furniture piece particular to the Dutch, and always included blind upper doors that were used to store a mixture of china and linen. Rare Early 19th Century Dutch Marquetry Inlaid Vitrine: The upper cabinet has glass on four sides and includes a fabric backing. The ornamented center piece is typical of Dutch style. Questions about our collection of Dutch antique furniture? 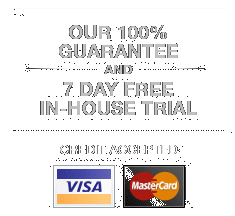 Send us an email or give us a call at 1-800-860-0109. 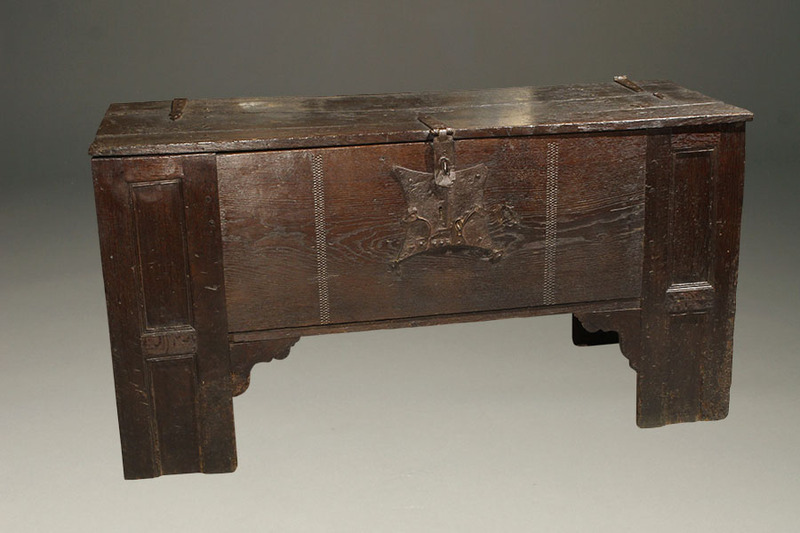 Although we may feel that coffers, also known as chests or trunks, are ubiquitous today, they have an interesting place in the history of furniture. Coffers were the Europeans’ first cased pieces. They started out as six-sided boxes with a lift-off lid. As time went on, craftsmen included hinges and locks. In the 1500s, the design took another leap forward as woodworkers realized the value of paneled construction. By creating a frame that would hold panels of wood rather than six solid pieces, the material was allowed to expand and contract, reducing cracking and increasing durability. Further additions like tills, interior compartments created to store valuables, made coffers even more useful. Some tills even had hidden compartments. 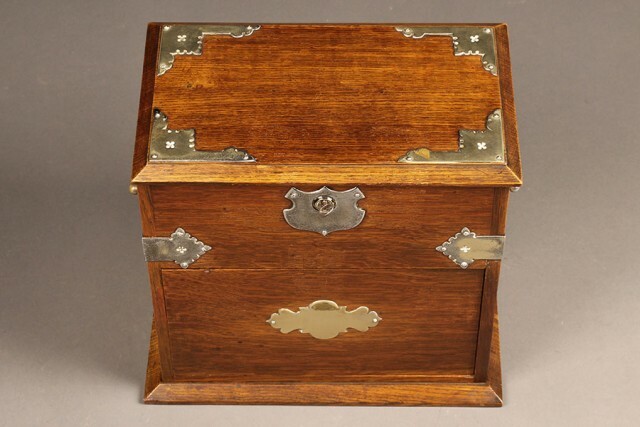 The latter part of 19th and early 20th century saw the rise of cedar chests for storage within the home. Coffers’ interesting dimensions and finishes, coupled with their functionality, make these lovely antiques useful and attractive for today’s home as well. Our customers use them in their entryways as seating options or storage, or as a decorative yet functional piece at the end of their beds. We are also seeing a trend of using coffers as a visual anchor below a mounted large screen TV. 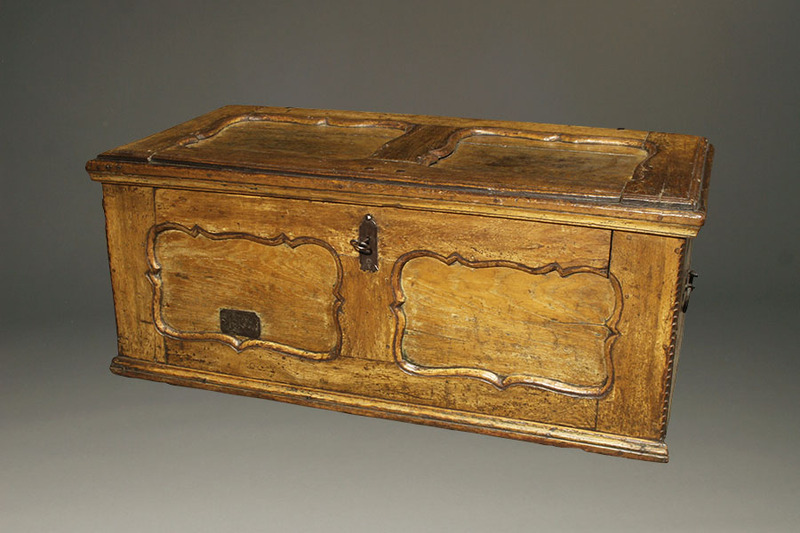 By the early 18th century, the coffer had evolved from a piece made for the upper class into furniture for the common folk too. 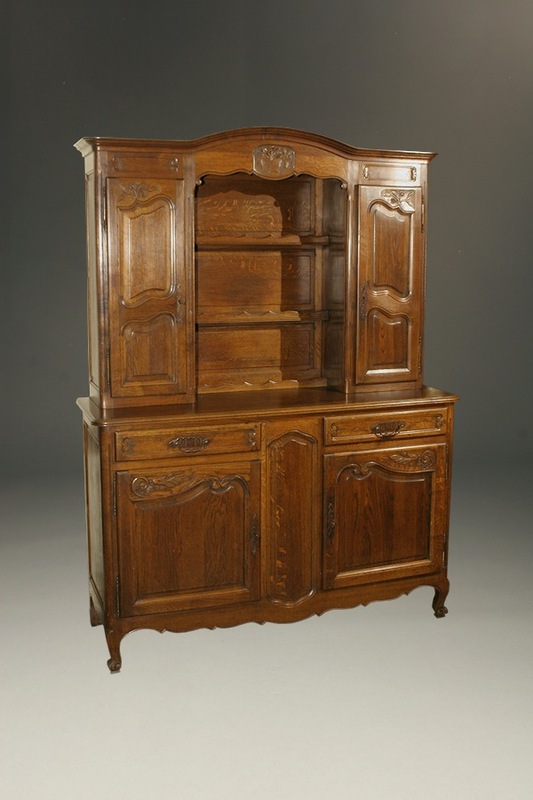 This lovely country French coffer was created to add beauty and functionality to a home. What makes this piece unique is the paneling design. Rather than the typical squares, the paneling was shaped to fit the trim. Wrought iron hardware completes the exterior styling. Constructed out of chestnut, the interior includes a till and the lid has an overlaying trim that goes around the base when closed. 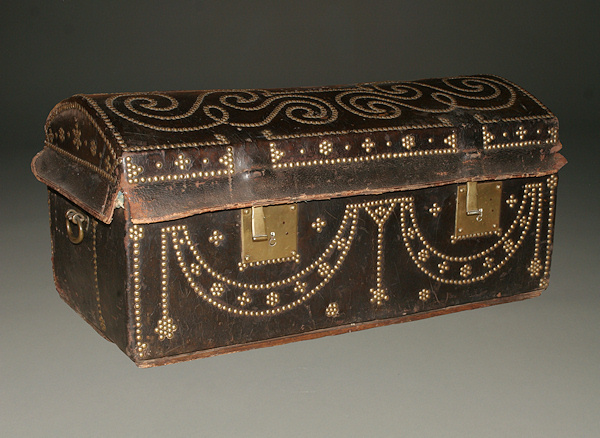 Circa 1870, this leather-bound coffer features head to head nail trim, a technique used to add design or pattern, on the top and on the face. The wood sub-structure was created first and then clad, or wrapped, with leather. Some coffers were also clad in canvas, and later vinyl, to offer a different aesthetic. This design also had the added benefit of allowing more flexibility in the type and tooling of the base wood, as it was not going to be seen. The interior of this coffer is lined in the original fabric. Yet another example of the detailed styling created by leather clad and head-to-head studded trim, this coffer also features a domed top. This style was initially created to add extra interest and dimension. However, with the creation of steamer trunks, domes were intentionally added to the pieces so they could not be stacked! The domed versions had to be placed on top of a stack of trunks, and therefore were at less risk of damage. 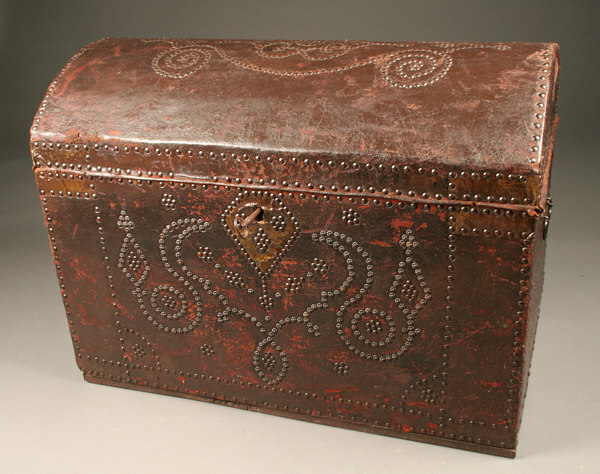 With its lovely trim work, we believe this coffer was used as a decorative piece rather than as a traveling trunk. The face features a swag design, while the top is adorned with scroll work. The piece also has hefty brass hardware and locks, and the rich brown leather has a stitched edging to provide a thick appearance. 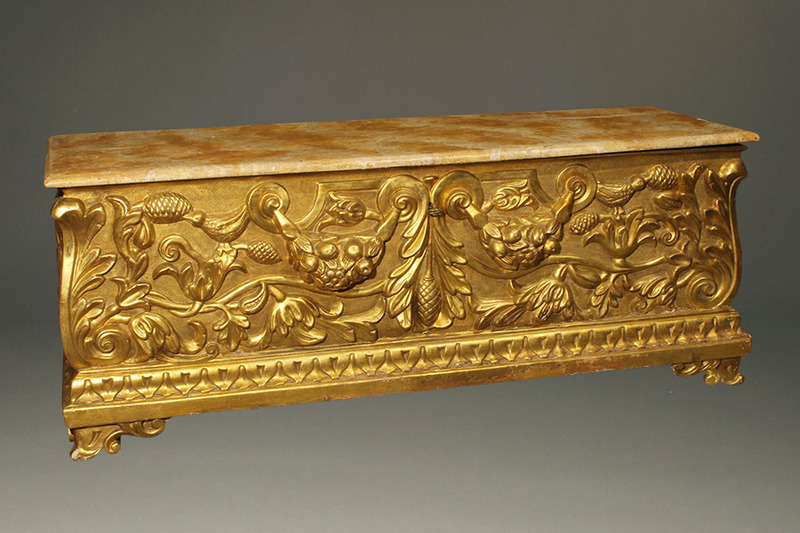 The Italians sure knew how to use gilt, and this coffer is a fine example of their handiwork. Circa 1890, the sides feature an impressive deep relief carving of garlands of fruit, nuts, and pine cones, scrolled and edged with acanthus leaves throughout. The carved base wood was then covered with gesso, sized and gold leafed. Some of the red sizing can be seen through the gold leaf, adding even more visual interest to the piece. The top is made of wood that has been polychromed (painted) to look like marble. The long hinges are made out of iron crafted to support the large, unframed lid. As you can see, our collection of antique coffers offers variety in style, design and history. The versatility of these pieces makes them a popular option for including antiques in today’s home décor. Whether placed at the end of a bed for blanket storage, or under a television as a visual anchor, these lovely pieces offer both unique styling and needed functionality. Questions about these or other coffers in our collection? Send us an email, or give us a call at 1-800-860-0109. Just like today’s furniture and accessories, antiques were crafted with particular styles in mind. In the case of European antiques, these decorative or architectural elements are unique to the time and place in which the characteristics were first crafted. As you peruse Beauchamp’s collection of 18th and 19th century antiques, you will note that some pieces are described by their style, such as Biedermeier era, or English Edwardian period or Louis Phillippe. Though our clients are antique-lovers, we have found that they do not necessarily know the details of each style. Therefore, we thought it would be helpful to offer a retrospective look at the different characteristics of 18th and 19th century antiques through a blog series, Styles of European Antiques. The Georgian Period spans far back into the 18th century and comes right up to the start of the Victorian era. It was the beginning of the widespread use of mahogany, of architects designing furniture, and the influence of both frivolous Rococo and logic-based neoclassical styles. But it was really the Mid-Georgian period designers that defined the look of the Georgian style. 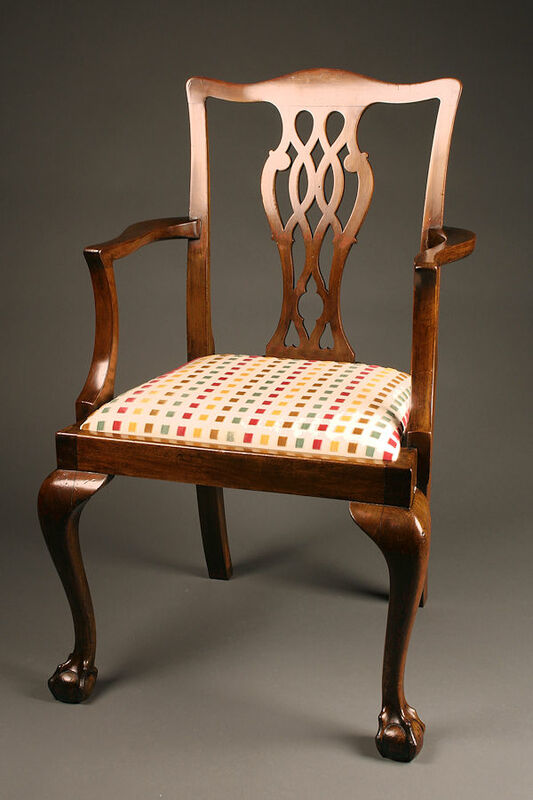 Those furniture makers were Thomas Chippendale, the Adams brothers, George Hepplewhite, and Thomas Sheraton. 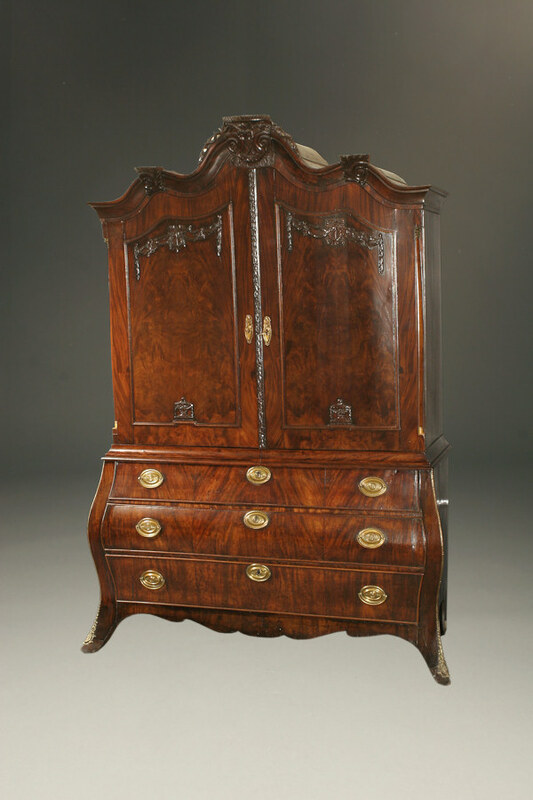 Like many earlier styles, Chippendale was popular in the 19th century as well. One hundred years after the Chippendale period there was a revival of his style that is referred to as centennial Chippendale. Thomas Chippendale drew much of his decorative style from Rococo, though he always chose to make his furniture functional and sturdy rather than sacrifice construction for appearances. This rather simple design choice showed his mentality leaning towards the neoclassical philosophy. The Georgian Period characteristics are most noted in Chippendale’s use of the cabriolet leg with carved feet. 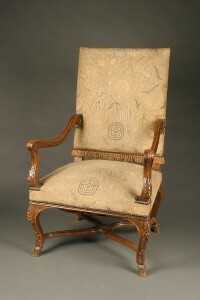 Though created in the 18th century, the Adam style also remained popular into the 19th century. Brothers Robert and James Adam were primarily architects employed by the very rich who began designing furniture due to the general shift in thinking about how a home is best constructed. The furnishings of a home and the house itself were now thought of as two parts of one whole. Thus, in order to design a home, one must also design the furniture, matching the outside architecture with the indoor furnishings. Robert had been studying abroad before he began his career, and he brought back Greek and Roman styles of straight lines and simple moldings, which he incorporated into his architecture as well as his furniture. He was responsible for the neoclassical style in England during that time. 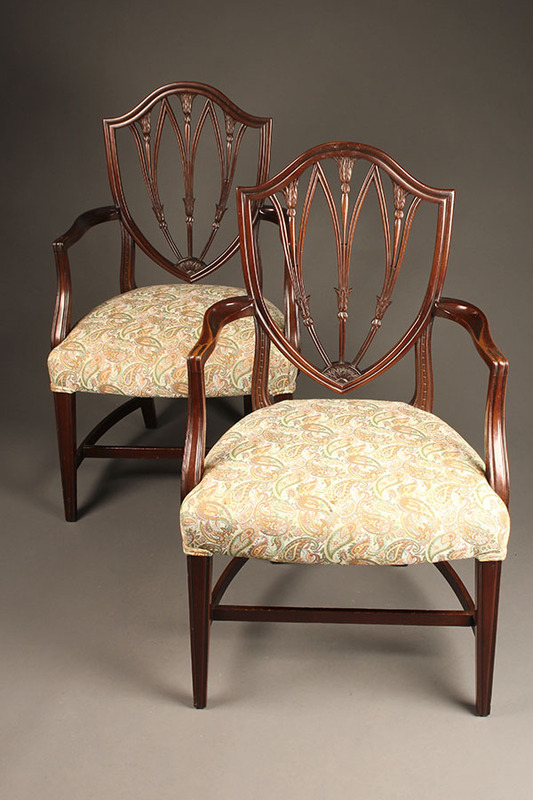 Another 18th century craftsman whose work signifies 19th century style, George Hepplewhite observed and learned much from Chippendale and Adam, and from their styles he picked and chose what he liked best to sell to a wide market. Hepplewhite designed furniture that kept Adam’s neoclassical simplicity, but also incorporated Hepplewhite’s love for curved lines. 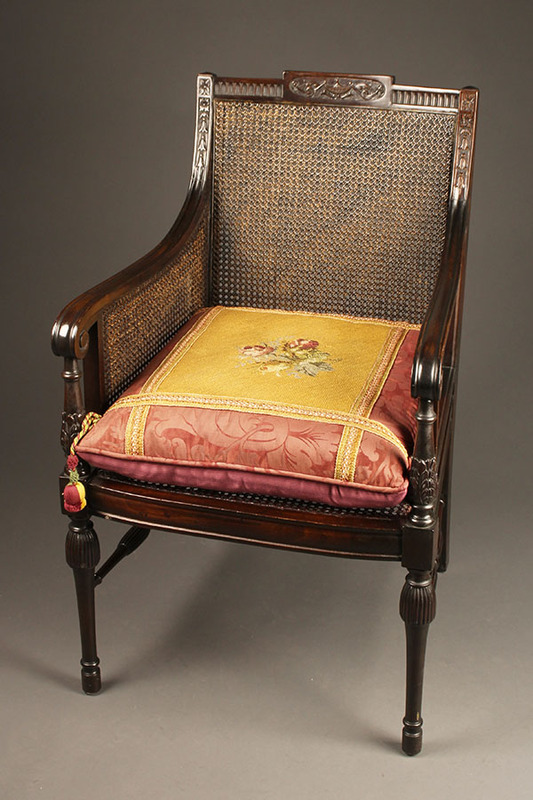 One can see his love for curves in his chair-back designs—shield, hooped, oval and heart-shaped backs were very popular in their day. 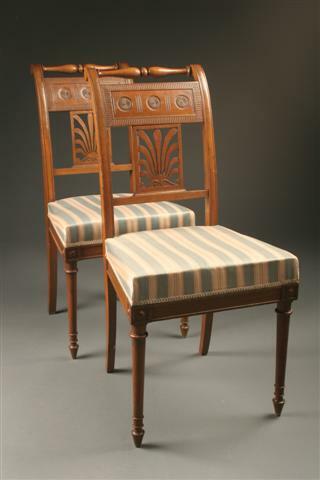 His style was lighter than Chippendale’s, using mahogany, satinwood and refined carving rather than heavy decorative carving. Though Thomas Sheraton worked almost into the Victorian period, his style was not a transition between the Georgian and the Victorian periods. 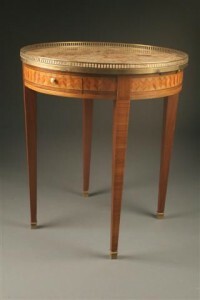 His furniture designs were heavily influenced by Louis XVI and Directoire French style. The end product was a lighter kind of neoclassical furniture. Sheraton in particular liked rectangular forms and mechanical inventions. He included many secret compartments, concealed drawers, rolling tops or sliding surfaces in his designs of secretaires, bureaus and writing desks. 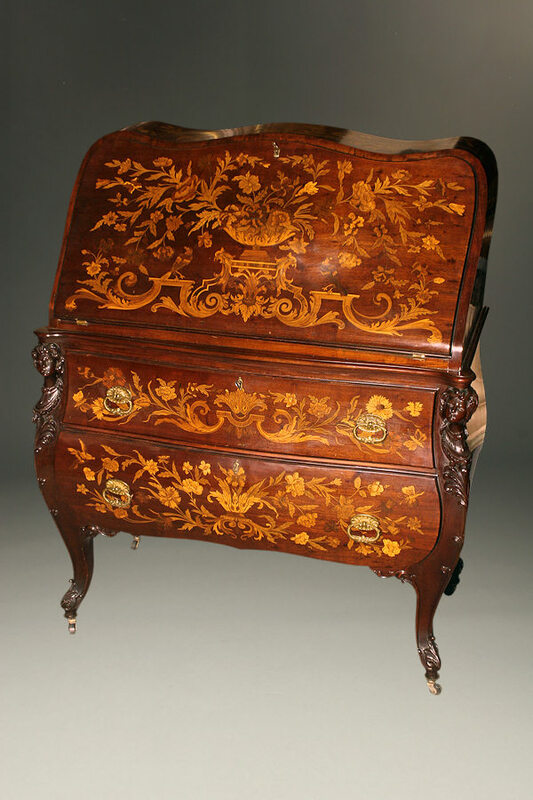 Mahogany was his main staple, but he used satinwood, rosewood, tulipwood and sycamore for inlaid decorations or for lighter pieces of furniture meant for drawing rooms. As per the neoclassical style, ornamentation was not overboard—brass fittings, contrasting veneer inlays, tapered legs, fluting and painted finishes made for most decoration. Carvings were sparse. The English Victorian style is the product of a society’s expansion. The middle class grew, trade exploded, and factories became capable of mass production as the industrial revolution swept Europe. Furniture was in high demand, not only because more people could afford it, but they also wanted lots of it. The middle class was demonstrating their wealth through crowding their homes with furniture. Unlike other eras, the Victorian Period did not see the rise of a new style over the old—rather, the era saw a revival and widespread use of a plethora of styles. Gothic, Tudor, Elizabethan, Neoclassical, Rococo, Jacobean, and various 18th century French styles mixed and were reproduced to furnish an eclectic taste. This mix of influences tended to produce designs that were extraordinarily ornate and not superior to their predecessors in construction. Some new materials and techniques were available to manufacturers—iron was used in many furniture pieces. Mahogany was the favored wood, though rosewood and walnut enjoyed wide use as well. 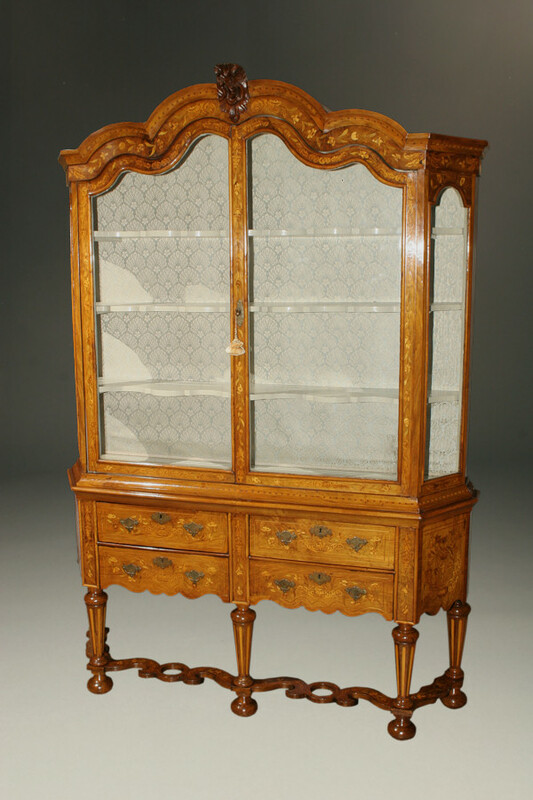 Popular pieces of the time were chiffoniers and sideboards inlayed with ivory. Questions about the different 19th century English antique styles? Send us an email, or give us a call at 1-800-860-0109. During his reign, King Louis XIV focused on establishing France as a leader in Europe, making the country an economic, political and artistic authority. The furniture of this era reflects many aspects of that ambition. Leaning away from the dramatic Baroque style popular in much of Europe at the time, Louis XIV commissioned artists who had a more classical approach. One such group of craftsmen was the Gobelins manufactory. The furniture they made for the royal court and nobility established a national decorative art style that emphasized grandeur. Furniture was often elaborately gilded with bronze or brass, inlaid with metals such as pewter and ivory, and veneered with tortoise shell or exotic foreign woods. Red and gold brocades, large sculpted sideboards and heavy marbling were also common. Pieces of this period make for rich furnishings, and their grandiose style is perfect for making a statement. After the rather heavily adorned style of Louis XIV, a new fashion emerged that pushed back against grandeur and opted for lighter elements. The Régence Style was the beginning of French Rococo, transitioning between the large, heavy pieces made for Louis XIV’s court to easily movable furniture made for smaller rooms. No heavy, carved ornamentation here—the point was to showcase a piece’s graceful craftsmanship. Furniture in this style has many gentle curves, natural patterns and motifs like foliage, bouquets, ribbons and bows. Curved ornamental mounts for chairs and table legs called “espagnolettes” are characteristic of this period, and it is interesting to note that the commode and the writing table made their first appearances during this time, due to the fact that furniture was being made for smaller, more intimate settings. A subset of French Rococo, Louis XV-style is characterized by superior craftsmanship. The superb carving, ornamentation with many different metals, inlaid woods, and lacquered chinoiserie, besides showing off the craftsman’s skill, also revealed the new movement to coordinate furniture with the rest of home décor. Painters, sculptors, and cabinet-makers all worked together to create the whole ensemble of a room for royalty and the nobility. Furniture was made to be both elegant and useful. Many homes had two complete sets of furniture: one for summer, one for winter. Decorative elements still stayed with the curves and natural elements of the Régence Style, but added more themes including painting scenes of Orientalia, frolicking animals, and exotic landscapes. Rare woods like tulip, lemon tree, violet and king woods were used, to sumptuous effect. Richly veined, tinted marbles were imported for decoration as well. The last phase of Rococo for France before the Revolution, Louis XVI-style also began the first phase of Neoclassicism. This style in turn was a revolt against the airy, frivolous Rococo. Furniture was made with emphasis on straight lines, right angles and logical design. Roman and Greek architecture and furniture was the main influence on this style—even incorporating fluted columns into designs. Decoration was restrained, but details were still delicate. Carved friezes, oak and laurel leafs, wreaths, branches, cherubs and lattice work are the motifs of this time. In the areas of craftsmanship and refinement, this was the golden age of French furniture. Continuing the Neoclassical style from Louis XVI, post-revolution. The Directoire was actually the name of the French Revolutionary government, which would yield to Napoleon Bonaparte’s dictatorship. Directoire Style is the artistic transition from Louis XVI to the Empire Style. Furniture continued along the Roman and Greek vein, reflecting stoic values, drawing on examples from the excavations of Pompeii and other ancient cities in Italy. Furniture was elongated, crafted in simple shapes and clear lines. Detail and ornamentation became sparse: there was minimal carving, though they applied decorative painting. Questions about the different 18th century French antique styles? Send us an email, or give us a call at 1-800-860-0109. 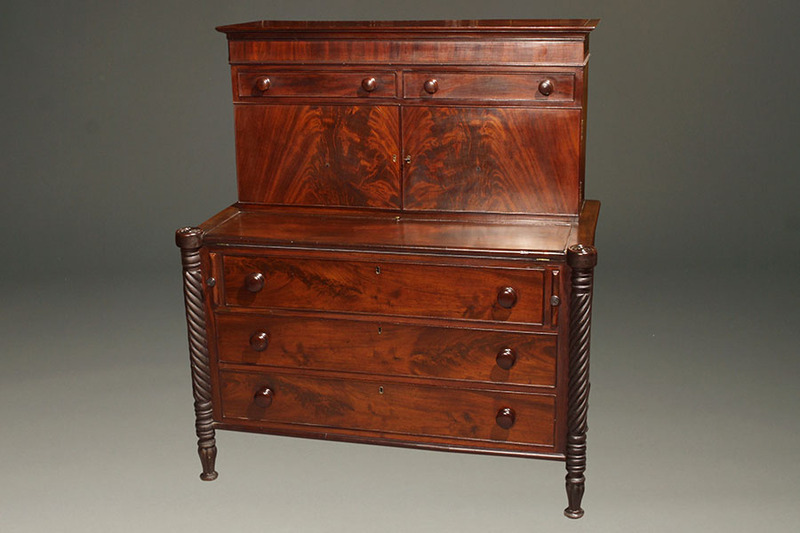 We at Beauchamp Antiques thoroughly enjoy the history behind antiques, and bonnetieres are a great example as to why. These lovely French furniture pieces came into existence in the mid-eighteenth century in response to women’s elaborate hairstyles of that time period. The large hats, wigs and other apparatuses (think the movie Amadeus) that were in vogue required tall, slender storage options—hence the birth of bonnetieres. Interior designers and homeowners alike come to us seeking unique pieces to enhance their décor. We see our antiques used in many different ways to embellish the final details of a design scheme. Accessories bring an interior to life. Once you paint, place the furniture, and hang the draperies, it is the accessories that bring out the look you are going for. From copper cookware and decorative boxes, to lap desks and mantle clocks, the wide range of indoor accessories offer unlimited opportunities to bring personality and creativity to your home.